You've heard of Ithaca, Syracuse, and Rochester. They're home to Cornell and Syracuse Universities, some of the nation's most prestigious schools. And they're known for getting tons of snow when there's a blizzard. But did you know that the region is collectively known as the Finger Lakes? A four-hour drive from Baltimore and five-hour drive from D.C., the Finger Lakes region is comprised of 11 lakes (10 of which are shaped like fingers, duh!) and 14 counties in central New York. Moreover, did you know that Finger Lakes is the second largest wine region in the United States behind Napa Valley? Yes, you read that correctly. There's 'wine country' right on the East Coast that's so much more accessible for those of us not easily able to get to Napa. The Finger Lakes has over 130 wineries and 85 breweries in the region with new ones opening each year. The area is known for great Rieslings but many types of wines are produced. In addition to several wineries and breweries, cideries and distilleries are also popping up in the area. Needless to say, if you're into trying various spirited libations and having a good time while doing so, you must visit the Finger Lakes. Bully Hill is a winery (more on it below), but there's a gratuity-free restaurant on the property that's popular with locals and tourists alike. They have a great outdoor patio area with an amazing view of Keuka Lake. Village Tavern on the Village Square has great tavern/bar food with sandwiches and burgers, but also a great selection of desserts and appetizers. They also have one of the largest wine and beer menus in the area. Union Block offers excellent Italian fare, but also has an in-house wine grotto. The combination of good food and atmosphere make for a unique visit. Timberstone is one of the newest additions in Hammondsport, but their menu is a great mix of beef, seafood and pasta. They pride themselves on using locally sourced foods. I highly recommend the Cranberry Tenderloin. Poppleton offers breakfast or lunch options, as well as a great variety of desserts, including crepes and all types of delicious pastries. I suggest heading here for lunch if you're checking out downtown Corning. The Cellar is an upscale restaurant in Corning with very diverse food and cocktail menus. I love that they offer everything from sushi to ramen to steak. There's something here for every hungry palette. I literally tried four dishes and enjoyed them all. Affectionately known as 'Dr. Frank's,' it was one of the first wineries in the region. Dr. Frank immigrated from Ukraine and revolutionized wine-making in the area. Its wines are also highly celebrated, as Dr. Frank's is New York's most award-winning winery over the past 54 years. Here, I learned to roll my wine glass to release the wine's bouquet instead of swirling it. I'll forever use that tip! I loved their 'Dr. Frank Gewürztraminer' wine. Pleasant Valley Wine Company is the first bonded winery in the country (meaning it was the first to be taxed) and one of very few wineries in the United States that can make champagne and label it as such. Since its Great Western Champagne won an award in Paris in 1867, it was grandfathered in before the 2006 wine trade agreement signed by France and the U.S., which officially now only allows champagne made in the Champagne region of France to be labeled 'champagne.' In addition to their champagnes, Pleasant Valley is known for their sherry and port wines. I highly recommend taking a tour of this winery to learn more about history of wine-making in the area. Wine & Spirits Magazine named a Ravines Wine Cellars' wine one of the Top 100 for the third time in five years. I didn't have a chance to try any of their wines, but word on the street is that they have very good dry wines. One of the more lively wineries in the area, Bully Hill is the largest privately owned winery in New York and one of the largest producing wineries in the state. I suggest eating lunch at their restaurant before heading to the fun tasting room. If sweet wines are your thing, you'll definitely find one you love here. 'Love My Goat' and 'Sweet Walter Red' were my favorites. Fun fact: Most of the artwork on their bottles was drawn by their late owner and founder, Walter Taylor. Keuka Lake Vineyards offers a cool juxtaposition to some of the bigger wineries and they're making some excellent wines with hybrid grapes. I wasn't able to get to this vineyard during my trip, but they specialize in drier wines. *If you're interested in going on the wine trail to check out more wineries in Finger Lakes, click here. Steuben Brewing Company is a family-owned brewery that offers both light and dark beers for everyone on the beer-loving spectrum. The farm brewery recently won the 2016 John Calen Memorial Award for Best Brown Ale in New York State at TAP NY, and also won a Silver Medal for Best Light Lager in New York State. While they don't have an official restaurant, they do offer a few bar foods and food trucks are on-site on weekends. My favorite beer was the 'Golden One' (I'm a light beer drinker!). Another family-owned brewery, the Iron Flamingo Brewery is the first craft brewery to bottle and distribute beer in Corning. Many of their beers are on tap at several restaurants in the area. They offer various kinds of beer, including the Porter Mocha Coffee, which happened to be my favorite. *If you're interested in going on the beer trail to check out more breweries in Finger Lakes, click here. The first distillery in Corning, Four Fights Distilling has been open for about a year. They currently offer tastings at their bar of moonshine, whiskey and vodka. However, I got a sneak peek at new products they're working on so I'm excited for their growth! Cider Creek is known for having excellent natural and gluten-free ciders. While I wasn't able to visit, I love a good cider so I'll definitely check it out during my next trip to the Finger Lakes. There are a ton of bed & breakfasts in the area; however, I stayed at the 18 Vine Inn & Carriage House. The owner, Catherine Powell, was very welcoming and probably knows more history about the region than you'll find in any history book. She makes delicious strawberry pancakes too! If B&B's aren't your thing, there's a Best Western being built nearby in Hammondsport. Currently, there's a Staybridge Suites and Radisson Hotel in Corning (which has a great breakfast menu!). Whether you're in Hammondsport, Corning or another neighboring Finger Lakes town, I guarantee you'll fall in love. I look forward to returning and exploring more of the region one day soon! *While this post was sponsored by Corning and the Southern Finger Lakes, all opinions are absolutely my own. Cape Town, South Africa is known for its sprawling landscapes, picturesque views and most especially its amazing wines in the popular areas of Stellenbosch and Franschhoek. However, about 30 minutes outside of Cape Town in neighboring town, Paarl, is Spice Route Destination, a one-stop shop that the whole family can enjoy. The name is a bit misleading, as there weren't many spices to taste. However, on this one property lies areas for wine, beer, grappa and chocolate tasting, two restaurants with various cuisines, a glassblowing shop, and places for children to play. Above is a map of the entire grounds, where you can literally spend the entire day eating and drinking your way to happiness. While I toured the entire property, I am going to highlight a few of my favorite spots. We hit the ground running and opted to begin with wine tasting. 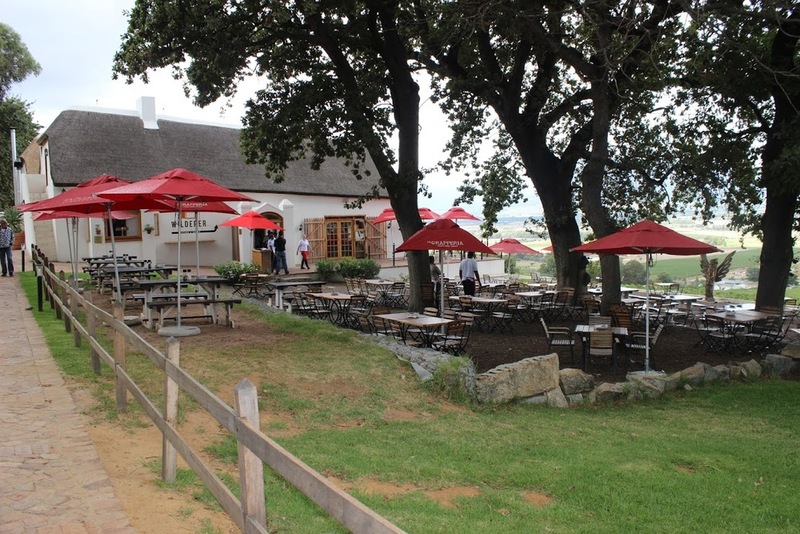 The tasting area is very quaint and offers a marvelous view of Paarl. Sit at a table or if you bring your own, you can lie on a picnic blanket on the grass. Wine & Charcuterie Journey at R85 per person which includes a selection of four (4) Spice Route wines paired with four (4) Richard Bosman Cured Meats. I chose the Swartland Wine Journey because I felt like I got the most for my rand. And it offered me a chance to try a variety of their wines. My favorite was their Chakalaka. I didn't get to spend much time here, but there were several Cape Brewery Company beers to taste. Beer lovers are able to follow the production process and then taste the beers on tap or at the tasting stations. I am a chocolate fiend, so I had to check out this cottage. There were chocolate food and drink options from all around the world. There were also chocolate tastings available. This place is a chocolate lover's dream. This may have been my favorite stop of the tour. I learned so much about grappa and gained a new-found appreciation. There are two (2) tastings available: Standard for R30 and Master for R50. Again, we opted for the Master Tasting...because why not? The Master Grappa Tasting included three (3) grappas, each about 47.5% alcohol and from various countries. Grappa definitely packs a major punch! Pro-Tip: After wine and grappa tasting, definitely eat at one of the restaurants for balance. We ate at La Grapperia and the pizza was delicious. I loved this colorful and unique shop. You're able to stand and watch the glassblowers create unique pieces of art with glass. Items such as vases, ceiling light fixtures, and everything in between were available for purchase. How could you not love Spice Route? If ever in Cape Town and want to check out a place that has everything under one roof for everyone in your family, Spice Route Destination is the place for you. It's also a great place for a get together with friends or a date with a significant other. Check out more pictures from my visit below! Pro-Tip: Get there early so you can enjoy the calmness of the property. Later in the day it becomes crowded and while still fun, you won't be able to take in all of the beauty it has to offer.